Conventional field service fleet management solution often requires each vehicle to have an in-vehicle fixed-mount computer for tracking and navigation, and a separate portable computing device for field workers to carry into field. 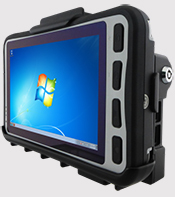 Winmate's Industrial Rugged Tablet PC with dedicated vehicle mount offers a two-in-one solution that can replace a conventional in-vehicle fixed-mount computer but can also replace a dedicated field-use tablet as it can be easily removed from the vehicle. 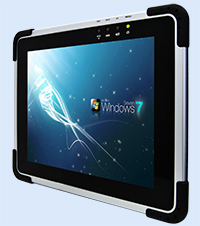 The tablets are available with Android or Windows Embedded 7 platforms, with GPS and extensive wireless communications options, providing field worker with advanced technology in a rugged form factor for reliable field computing, communication, and data collection. For sanitation truck fleet management, each vehicle needs to be equipped with a GPS tracking device, as well as an internet connected device to enable real-time route navigation and job status update to driver. 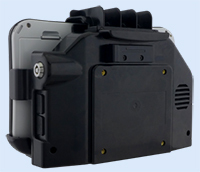 The application also asks for easily serviceable hardware that still requires secure mounting. 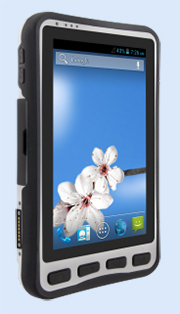 Winmate 7" Industrial Rugged Tablet PC M700D with vehicle mount has been installed in every sanitation truck. Via GPS-enabled the tablet PC, sanitation truck control center tracks the location and movement of their fleet. 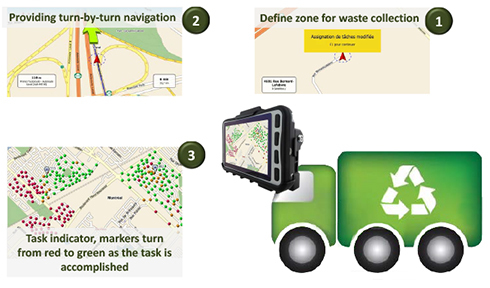 The dispatcher also defines zones, schedules, and assignment online, and the information are delivered to each vehicle via the 3G-enabled M700D tablet with web-enabled applications, providing the drivers up-to-date job status feedback, as well as optimized route for the most efficient waste pickup. 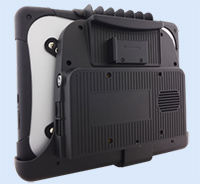 Vehicle docking in this application not only provides a secure (key-locked) and robust mounting solution for the M700D tablet, but also provides expansion to the connectivity of the M700D.